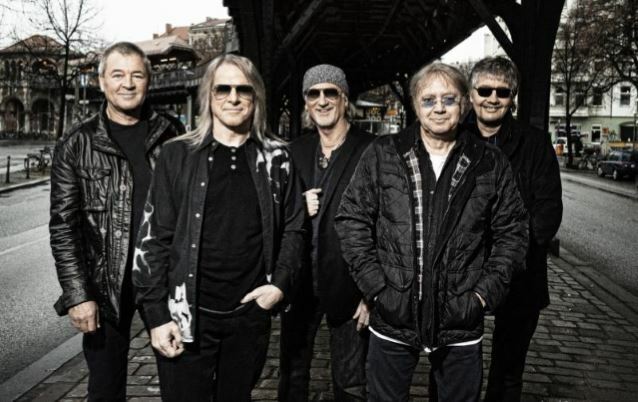 DEEP PURPLE, CHEAP TRICK, N.W.A., CHICAGO and Steve Miller will be inducted into the Rock And Roll Hall Of Fame on April 8, 2016 during a ceremony at Brooklyn, New York's Barclays Center, with tickets on sale to the public in February. HBO will broadcast the show in the spring. The DEEP PURPLE members that are being inducted are: Ritchie Blackmore, David Coverdale, Rod Evans, Ian Gillan, Roger Glover, Glenn Hughes, Jon Lord and Ian Paice. Asked if he thinks that makes sense to bring in those people, Paice told Rolling Stone: "I suppose it does. Realistically, you'd like to think that anyone who was ever in the band made a contribution and should really be listed. It doesn't matter if they were there for an album or two; everyone who was in the band actually contributed to the fact we're still there. All these people, from the very beginning to the current lineup, [have] helped maintain PURPLE as a viable touring entity that a lot of people around the world really enjoy. So to pick some over others, I wouldn't have done it that way." Paice also agreed that part of the problem why it's taken so long for DEEP PURPLE to get inducted is the fact that so many voters are in America and DEEP PURPLE was never quite as big in the U.S. as the band was overseas. He said: "Of course, that does effect what people are aware of. If you're not seen on the U.S. touring circuit very often, then why would U.S. voters pick you? It's not a criticism. It's just a reality of life. Certain parts of the world have different musical tastes now. I'm not saying there aren't a lot of rock and roll fans in the States, but what is covered by the media and what is thrown in front of people by TV, like the flavor of the month, segregates things quite badly." He continued: "We'll do a show where we'll have a wonderfully mixed audience of kids in the front, then people that are slightly older until you get right to the back. In other countries, you just have an audience of more mature people or just kids. It's been broken up in a way, which is so sad. The best shows are where everybody, of whatever age, are experiencing the same thing and getting the same buzz out of it. You need the kids to kickstart it, and once they get it going, the old folks remember why they went to a rock and roll show in the first place. It's a wonderful feeling when it all kicks off like that. In the U.K. and the States, the media has cut the generations in half away from each other. It's very sad." Paice added that any decision regarding a possible performance at the induction ceremony will have to be made with the blessings of all the current members. "We don't have salaried guys with [keyboardist] Don [Airey] and [guitarist] Steve [Morse]. They are fully accredited members of the band and they share in everything, and into decisions as well. They will have to be consulted and see how they feel about anything that the three of us originals think we would or wouldn't like to do." METALLICA drummer Lars Ulrich told Rolling Stone last year that he still hoped DEEP PURPLE would eventually get recognized by the Hall. "I'm not gonna get into the politics or all that stuff, but I got two words to say: 'DEEP PURPLE,'" he said. "That's all I have to say: DEEP PURPLE. Seriously, people, 'DEEP PURPLE,' two simple words in the English language. But definitely, NIRVANA is a no-brainer for the first year and I'm glad that KISS [got] the long-overdue recognition that they deserved for everything that they pioneered, and then I got two words, 'DEEP PURPLE!' Did I say that already?" At their own induction in 2009, METALLICA's James Hetfield included PURPLE on a list of acts they wanted to see in the Hall. "We're somewhat of a heavy band and we have a small list that we'd like to also put some nods out and maybe plant a little seed, it's a band called DEEP PURPLE, THIN LIZZY, TED NUGENT, IRON MAIDEN, JUDAS PRIEST, MOTÖRHEAD... who we would love to invite through the door now."